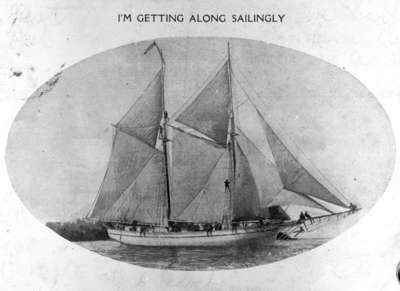 Black and white negative of a photograph of a postcard showing the Maple Leaf schooner on the front. The Maple Leaf was owned by Captain Richard Goldring (1859-1945) of Port Whitby. He operated the schooner until 1911 when he became a store keeper at Port Whitby. <i>Maple Leaf</i> Schooner, 1907, unknown photographer, Whitby Archives, 11-001-013.